Enjoy room for storage and display. Add heirloom quality furniture to your collection. Develop your contemporary style. All this plus the thrill of customizing your furniture comes with a new Amish Tuscany Hutch. The Tuscany has clean cool contemporary lines and features unique storage options that include six drawers, two lower cabinets, two upper cabinets and a central shelf compartment. 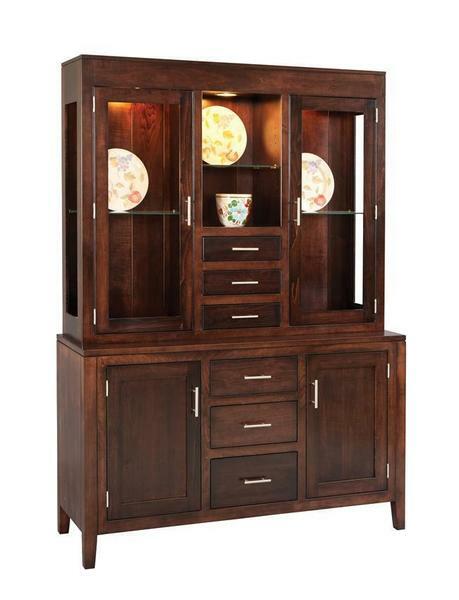 When you love spending time in your dining room, a hutch like the Tuscany adds storage and styling in one. Design this wood hutch with the custom options that work best for you. If you'd like personal assistance, our Amish Furniture Specialists are always happy to help. Email or call us today. Thank you for shopping with DutchCrafters.